Picture this – you’ve finally finished that PowerPoint presentation you’ve been working on. The data is compelling, the slides are tight, and the visuals are strong. Then you click Save and realize it’s also GIGANTIC. Like 30,000 KB huge. This is no good, since oversized and bloated PowerPoint files can be difficult to share and challenging to upload for others to see. The performance of your slides can even suffer at times too. So here we are – as the great Jon Bender would say, your slides are “pushing maximum density.” (What, I can’t make a Breakfast Club reference? John Hughes FTW!) In these cases, the culprit is almost always too many large images or media files in your slides. Fortunately, there’s an easy fix to get them down to size quickly. First, simply choose an image (any one will do) to edit with PowerPoint Picture Tools (all you have to do is double-click the image to open this view). Next, select the Compress Pictures option to the left of the tool bar. The resulting popup will give you the option to compress the size of the image you selected (with the Email option being the smallest). 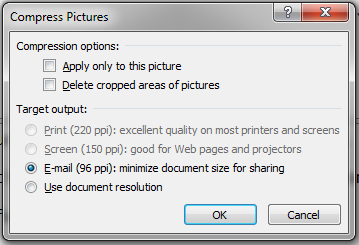 By unchecking the “Apply only to this picture” option, you can reduce the size of all the images in your desk. Just be sure to consider how your presentation will be used when making your selection. That’s all there is to it! Resave your presentation and you’ll see your PowerPoint file has been shrunk down to a much more manageable level. It’s as simple as that.